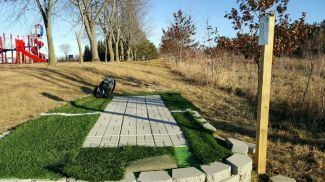 Description: Recreational course located on school grounds. Only available to the public outside of school hours. No alcohol or tobacco is permitted onsite. Local Directions: From the intersection of US Highway 71 and 24 in Bertha, go East on 24 (Main Street) until you reach 23/Central Avenue. Turn right (South) and head past the school. Parking by the Hole 1 tee is in the dirt parking area on your left.